SurvCE 4.0 has been released and is now ready for download. Constantly being upgraded, SurvCE 4.0 gives users the option to import text in drawings in addition to blocks; allows GPS base records from the raw file to be processed into the CRD file; and offers a new 2D sketch polyline and snap option. 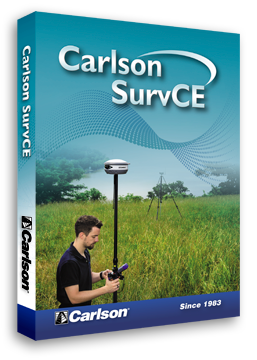 Version 4.0 of Carlson Software’s SurvCE data collection software now includes a Live Digital Level (LDL) or electronic bubble vial feature. Learn how to configure SurvCE 4.0 for the LDL. Use of RTCM 3.1 messages from virtual reference stations to auto-compute grid and geoid shifts. Tab-Based MENU Structure. All commands are visible in each menu, preventing the need for Up-Down Arrow Keying to view options. Collect points in the graphics mode. Points plot as they are shot in the field or entered. There is no need to switch between screens to view your points. Supports LandXML points, DTM, graphics, alignments, profiles and sections. SurvCE has a colorful look. Icons have been standardized to create continuity throughout the product, while modernizing the user experience. The Hot List lets users jump to the SurvCE routines that previously had shortcuts without having to memorize key strokes. It also provides shortcut functionality to devices without keyboards. SurvCE can compute volumes between two surfaces, one surface and an elevation or simple stockpile volumes. Surfaces can be defined by graphical entities and points or by Carlson TIN files. The software has optional on-board help files. These files are the entire user manual and can be installed separately. Click on the SurvCE icon and select Help to get the help document that pertains to the current routine. SurvCE can be used to collect trigonometric level loops and digital level loops. Loops can be processed and adjusted on the device and all existing project coordinate points can be updated. SurvCE supports several GPS network protocols, such as NTRIP, TCP and UDP. The software supports an unlimited number of localization points. All project scale settings and coordinate system options have been centrally located in the localization dialog. SurvCE allows users to “Configure” how each reading is measured with regard to direct and reverse options (Formerly know as SS/Trav). If direct and reverse readings are taken at the backsight, then any direct and reverse foresight will be considered an angle set and will be reduced accordingly. This eliminates the need to use a separate routine for angle sets. Point Number by Interval –SurvCE can interval the point ID by using the “Add to Next Pt ID” option. To number all points on the odd numbers, start at 1 and use 2 in this field. SurvCE can collect parallel lines using the offset horizontal and offset vertical line drawing commands and close a rectangle by three points using the rectangle command. In the settings section of Special Codes, the user can even auto compute and store the additional points at the line vertices that were created by the software. SurvCE allows the user to code in numerous coding styles that may be defined by their office package. SurvCE keeps track of every instrument completely separate. This includes all base stations, rovers and total stations, so that mixing equipment is easy. Simply configure your gear once and forget it. The instrument icon has been enhanced to allow you to switch between your current equipment. SurvCE supports staking offsets on a skew angle and provides the option to stake offset intersections and bisectors at angle points and the radius or PI point of an arc without leaving the Stake Line/Arc routine.